with David Bevan, Robert Brignall, and Andrew Elvey Price. We establish an improved lower bound of 10.271 for the exponential growth rate of the class of permutations avoiding the pattern \(1324\), and an improved upper bound of 13.5. 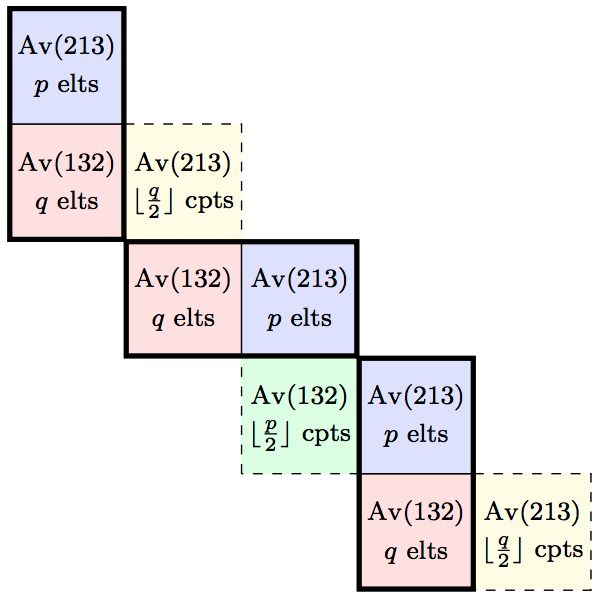 These results depend on a new exact structural characterisation of \(1324\)-avoiders as a subclass of an infinite staircase grid class, together with precise asymptotics of a small domino subclass whose enumeration we relate to West-two-stack-sortable permutations and planar maps. The bounds are established by carefully combining copies of the dominoes in particular ways consistent with the structural characterisation. The lower bound depends on concentration results concerning the substructure of a typical domino, the determination of exactly when dominoes can be combined in the fewest distinct ways, and technical analysis of the resulting generating function.